What will be the 2 new team names? In 2008 when 8 franchises were to select the names for the eight teams, some guys did a blunder and some excellent names. Chennai Super kings, Delhi Daredevils, Deccan Chargers, Kings XI Punjab, Kolkata Knight Riders, Mumbai Indians, Rajasthan Royals and Royal Challengers Bangalore. Those are all awesome names. Now, two new teams are in. Kochi and Pune. In 2008, it was not much awaited to know the team name. But, after 2 seasons of IPL, it has totally changed. The cost of the team is more than 3 times that of 2008. So, you can drop in the team names you want the owners to keep and if by luck they see it the name you kept may become the team name. Pune and Kochi joins IPL! Yet another auction in the Indian Premier League. 5 groups were bidding for it. But, Sahara and Rendezvous World Sport paid an huge amount that Lalit Modi too didn’t expect of. The Pune franchise were won by Sahara Adventure Sports – a part of the Sahara Group with a winning bid of USD 370 million as the highest bid. Sahara had bid similar amounts for three cities namely Ahmedabad, Nagpur and Pune and finally selected Pune as the host city for the new franchise. The other franchise went to Rendezvous Sports World who won the Kochi franchise with a bid of USD 333 million. We are absolutely delighted by the overwhelming response to our global Franchise Invitation to Tender process. As you can see the bidding for the two new official Franchises has been fair and transparent and is indicative of the revenue earning potential that the Indian Premier League represents. I am also certain that the IPL fans in Kochi and Pune would be particularly excited with an IPL franchise for their respective cities. Given the high quality of franchises that we have selected, we are certain that both the new franchises will do everything in their power to ensure good competitive teams for next year. The IPL is undoubtedly the most ground breaking international sports development in living memory. There is no precedent for what has been achieved by Mr. Lalit Modi and the BCCI over the last three years and the Sahara group is immensely proud to have won the Invitation to Tender from Pune. Matthew Hayden recently released the bat for the IPL 3 in Chennai. If you see a picture of it, you will laugh. A giant batsman using a bat with blade size till the knee. Yeah, this is the latest T20 Cricket bat as you know and Matthew Hayden smashed the Delhi Daredevils in their den for 93 runs all over the park. Matthew Hayden, Andrew Symonds and Dwayne Smith will be seen using this bat. These bats have smaller blade and longer handles. The bat will help the cricketers to score runs faster, said the Old fox. He said that in the beginning he was not sure whether these bats would be suitable for the players but after trying it he became convinced of its capability. All these bats will bear the signature of Matthew Hayden. 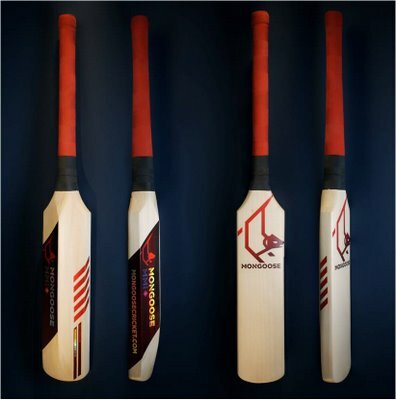 The price of the bats will vary between 17000 INR to 23000 INR. It is always good to try out new products. The mongoose bat is a good product as its gives you lot of power to hit the ball a long way. It is very much like a normal bat, but it surely gives a great deal of power with its sweet spot at the centre of the bat. The bat’s extra power comes from increased rigidity in the blade and increased flexibility in the handle – so you can hit further and harder.Its blade is 33 per cent shorter than a conventional bat and the handle is 43 per cent longer. Scientists call it the bat’s MMi, or ‘mass and moment of inertia’. It determines the amount of effort required by the batsman not only to swing, but also control the bat during the swing. This makes the Mongoose a lighter, harder-hitting bat. And while it looks different to a conventional long-blade bat, when you pick it up its weight and handling feel pretty much the same. The Mongoose also reconfigures the shoulders by dropping them down nine inches. The weight taken from the shoulders – about 20 per cent of the blade weight – is redistributed to the back of the new, shorter blade. The BCCI was just counting in crores and Lalit Modi was just a common before the making of IPL. But now Lalit Modi is world renowned BCCI has no time to count their income. The greatest spectacle this year is that they are even earning more thanks to new brands signing deals. Even without the Tournament’s spectator capacity, the Richest board will get rich by Rs.750 Crores this year which is 25% more than last year all because of various deals. Three-year deals with Internet giant Google worth 80 Crore. General entertainment channel Colors inked in January Rs 100 Crore. Swiss watch brand Banderlier, Karbonn Mobiles, Indiagames, Maxx Mobile, V Rock Mobile, Global Cricket Ventures for merchandising, which collectively are worth at least Rs 125 crore a year. Tyre company MRF, too, joined the IPL brandwagon by sponsoring the blimp, a balloon that floats over the stadium, in a deal said to be worth Rs 15 crore a year. The former Rajasthan Royals Player, Ravindra Jadeja’s appeal against a 1 year ban from the tournament, for talks with other franchises without even updating the contract with Rajasthan Royals has been rejected by the so called Lalit Modi’s team. Jadeja’s contract already elapsed December last year. Ravi has claimed that he had taken BCCI’s permission to negotiate with other franchises. He (Manohar) did not want to set a wrong precedent, so he dismissed the request. So Jadeja now cannot play in the IPL (this year). Jadeja received the ban was last month where he was found to have talks with other franchises. IPL Commissioner Lalit Modi believes that Test Cricket can be saved only if it adapts to be played under lights and it goes day night. The five-day game should still be the pinnacle and the ultimate test of skills. You don’t need to fiddle with the format at this stage. All you need do is change the timing. If we went day-night then we would see a real resurgence in the ratings. But he is not to leave the T20 game. He tells that T20 surely will surpass Test format. Watch IPL from anywhere you are! Hmm..! What is Lalit Modi going to do next? First, Live IPL on Youtube, next IPL in theaters. Now he has planned to screen IPL in Public Places. Hotels, Pubs, Bars all will soon have IPL. Yes. Innovate, thats his aim. He is the next Kerry Packer. Its a great boom. Where ever you are! Lalit Modi won’t leave you. He will surely make you watch IPL. So, about 10 days for IPL. Quite a lot of time for him to innovate more. Lets see what he does. The owner of the most famous league, Lalit Kumar Modi has warned the players who will opt of of the IPL 3 this year and axe them from playing the rest of the tournament. This message mainly went to the Australians who had some security concerns from playing IPL. The government has already given ample assurances for safe conduct of games. The call will be theirs. We will allow replacements for those who decide not to show up. We have 98 players on the waiting list eager to get called in. There is the Maoist or Naxalite strand which tends to be rural-based groups who act against security forces from the Indian establishment. You’ve got separatism, the long-term problem up in Kashmir, and probably the most challenging strand of terrorism that faces the Indians in the Islamic Al Qaeda element. Of course it’s always a matter of opinion as to how much influence there is from Al Qaeda in Islamic terrorism and how much is domestic. I think, based on recent events, they would be the most capable. They’ve shown intent and a lot of determination to press their attacks home. Lets see how this issue progresses!! !